The PX-30 (left) and PX-10 (right) Visual Presenters by ELMO are set to be the most powerful document cameras on the market. 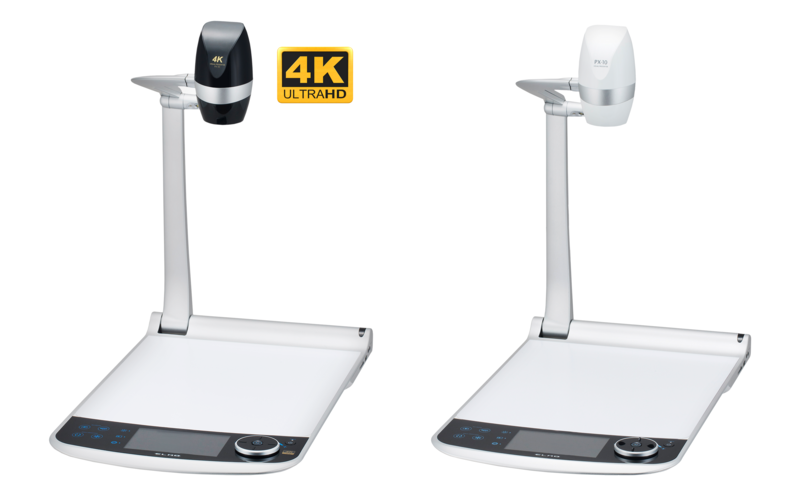 ELMO USA Corp., a global leader in education technology for over 45 years, adds the NEW PX-30 and PX-10 Visual Presenters to their industry-leading document camera lineup. The PX-30 and PX-10 are set to be the world’s sleekest, most powerful document cameras to date. With an unprecedented 288x zoom, the PX-30 and PX-10 capture every incredible detail. The PX-30 captures in ultra-vibrant 4K resolution, recording video at 30fps that can be saved via SD card, USB flash device, or the camera’s internal memory. The PX-10 Visual Presenter is equipped with 1080p Full HD resolution and records up to 60fps video. Both models offer a variety of shooting modes including 4:3, widescreen 16:9, and a capture area of up to A4 portrait and A3 landscape. Each model features the all-new 5” High-Resolution LCD preview monitor with sleek touch-screen navigation designed for easy camera control, a zoom toggle wheel with autofocus, and multiple output options (HDMI, VGA, and USB on both with additional HDBaseT and TCP/IP control on PX-30 model only). The platform stage is magnetic and comes with a custom whiteboard surface to write on with dry erase markers for annotation during demonstrations. Powerful 288x Zoom – PX-30 and PX-10 offer an unprecedented 288x zoom (12x Optical / 2x Sensor/ 12x Digital), offering the closest zoom on the document camera market. 4K Video Capture (PX-30 Model) – Record 4K video at 30fps that can be saved for later review via SD card, USB flash device, or the camera’s internal memory. Wide Screen Mode – Both models offer a variety of shooting modes including 4:3, widescreen 16:9, and a capture area of up to A4 portrait and A3 landscape. Touch Navigation – The camera’s platform stage has a touchscreen designed for easy navigation, zoom toggle wheel with autofocus, and all-new 5” LCD panel and multiple output options (HDMI, VGA, and USB on both with additional HDBaseT on PX-30 model only).